"It’s my sense that the prospects for fundamental financial reform are fading. Does anyone remember the case of H. Rodgin Cohen, a prominent New York lawyer whom The Times has described as a “Wall Street éminence grise”? He briefly made the news in March when he reportedly withdrew his name after being considered a top pick for deputy Treasury secretary. Well, earlier this week, Mr. Cohen told an audience that the future of Wall Street won’t be very different from its recent past, declaring, “I am far from convinced there was something inherently wrong with the system.” Hey, that little thing about causing the worst global slump since the Great Depression? Never mind." We've used this analogy before: why is the fox always appointed to look after henhouse security? Britain has a particular knack for doing this. HM Treasury has released a study entitled UK international financial services – the future: A report from UK based financial services leaders to the Government. "The Government and the industry should collaborate in order to maintain and expand the UK’s central role as a finance portal for the rest of Europe and the world. . . "
Be afraid, very afraid, when the kids take control of the tuck shop keys. "This is an exercise in pure propaganda - there is almost no real analysis here. Time and time again the people at the root of the problem are put in place to solve the problem – and they have this blinkered attitude – There is an extraordinary failure to consult outside their group." 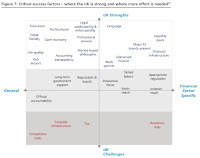 Check out their chart on page 31, which takes a somewhat dubious look at Britain's so-called strengths and weaknesses (click on the chart to enlarge it). Britain is rated poorly on "competitive costs" - which presumably means the cost of housing, transport and general living and so on. This is fair enough, but why is Britain, and particularly London, so expensive. It's because of the financial services industry! It has stoked demand hugely, especially in the housing market, requiring huge numbers of people to resort to debt driven puchases which few can afford. The City's prominent role as a global capital market (with huge tax concessions to non-resident depositors) has attracted massive inflows of essentially portfolio capital, keeping sterling over-valued in comparison to major European economies and 'crowding-out' the potential for investing in non-finance activity, especially in the South-East region. Success? We think not, especially now that we have handed over a record level of peace-time national debt to the next generation, entirely because of the incompetence and greed of those talented and upstanding folk in the City of London. Britain's private finance initiative, massively boosting the financial services industry, has further served to make Britain a more expensive place to do business. And a more unequal society. Britain is described as "expat friendly." What that means is that Britain provides a highly abusive tax regime for "non-domicilied" residents, an abomination in the British tax system that has invited any number of dubious criminals to live in London, pumping up local house prices. The report fails to raise the urgent questions about this rule, unlike Martin Wolf. And where does tax figure in their analysis? You guessed it: on the negative side of the balance sheet - represented as a challenge. Which it is for those who make their living from avoiding it. Because at the end of the day, what London and its satellite tax havens on the Crown Dependencies and British Overseas Territories is really, really good at, is avoiding tax. This is where the so-called comparative advantage lies. Not in the competitiveness of lawyers or bankers fee rates, or the excellence of their ability to understand risk and investment management (the crisis has put paid to all that nonsense). Nor in safe-guarding people's savings and pensions - the latter being in a state of total crisis. No, the City's real specialism lies in tax avoidance. Britain used to provide butlers to the world's wealthiest. Now it provides tax avoidance schemes. Is this progress? Britain has "accounting transparency"!!? As readers of TJN's, or Richard Murphy's, or Prem Sikka's published work will know, this is a gross misrepresentation. Both in the private and public spheres, accounting deficencies cause materially important information to be withheld from investors, voters, and all other stakeholders. Just try finding out about the costs of private finance initiative projects. Or tax avoidance schemes implemented by major British corporations. Unbelievably, the report claims that the financial services industry in Britain is not too big - and what comparison do they use to support their case? Singapore and Hong Kong! Two of the biggest, dirtiest tax havens in the world, which are even more captive to financial capitalism. Perhaps if they had taken a balanced approach they would have made more useful comparisons with countries like Germany, Australia or Sweden, which have succeeded in keeping a more diversified industrial base. The report makes a lot of the growth of international trade flows since 2000, in the context of globalisation - yet they don't appear to recognise that a large part of this growth comes in the form of trade in goods and services within multinational corporations – it shows up as cross-border trade – but an awful lot of that is being driven by tax avoidance and tax arbitrage issues. Do the report's authors even know this.? The ascendancy of self-interest over public interest in the political sphere is live and kicking. And the City remains firmly in control of Whitehall. This report is a scandal in the commissioning, in its failed ideological position, and in its brazen promotion of special interests. Shame on everyone involved, including and especially the Chancellor of the Exchequer.